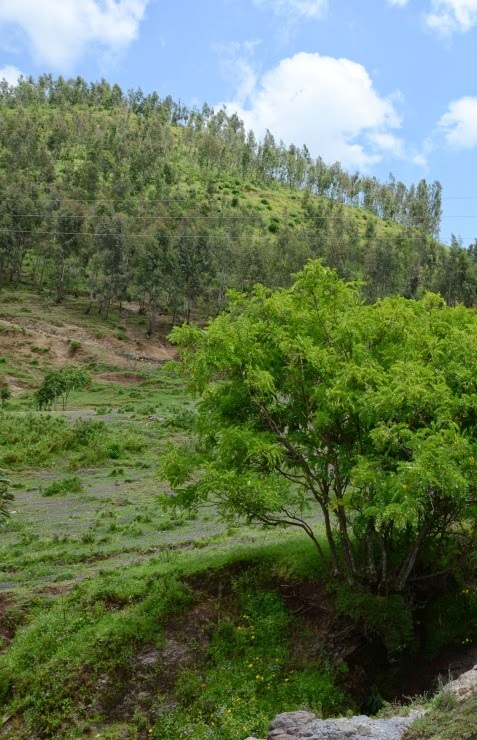 In many developing countries , including Ethiopia, Eucalyptus spp, was first introduced as a fast growing cash crop, sold to meet growing construction and energy needs. Eucalyptus’ fast rate of growth, even on degraded land, and its ability to ‘drain’ swampy areas is viewed by many as its greatest asset. However, Eucalyptus has been at the centre of an environmental and sustainability debate for years. Since Eucalyptus woodlots are cash crops, they can help to reduce human pressure on natural forests. On the other hand, Eucalyptus woodlots are densely planted (to ensure straight poles for construction) and they have little understory foliage growing beneath the trees. Eucalyptus is an invasive plant and it’s leaves prevent the survival of other plants, thereby creating a sterile forest floor bereft of biodiversity. This makes the land that Eucalyptus grows on even more vulnerable to erosion, especially as water that drips off leaves increases the natural erosivity of rainfall. Combined with the huge water demands that Eucalyptus trees require, in excess of 4000 litres of water per tree every day to achieve its full growth rate, it’s no wonder that environmental specialists are continuing to question its relevance to sustainable development. Despite these enigmatic effects, Eucalyptus is still highly valued. 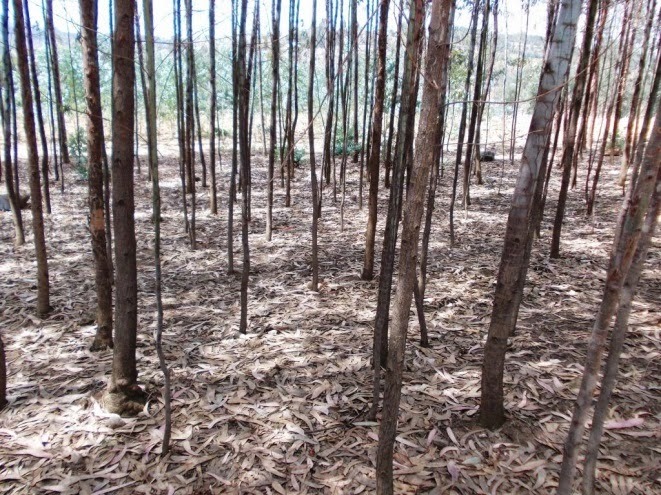 In Ethiopia, and other areas of the world, Eucalyptus woodlots increasingly represent a major, or even sole, source of income for households. The farmers of the Lake Tana Watershed, in the Amhara region of Ethiopia are no exception. They grow Eucalyptus poles that are sold for use in construction. The IFAD and GEF funded ‘Community-based Integrated Natural Resources Management Project’ (CBINReMP), has been working with smallholders to develop participatory forest management approaches that encourage the regeneration of indigenous forests and the sustainable management of Eucalyptus woodlots. Recently, the project began investigating a spontaneous community innovation; using Eucalyptus trimmings to make charcoal. A typical building pole is 6 m in length - after trimming between 1 and 1.5 m from the raw length. In the past, these trimmings were a waste product, as Eucalyptus wood is not a desirable fuel for the domestic cook stove, because its high gum content makes it burn too fast. 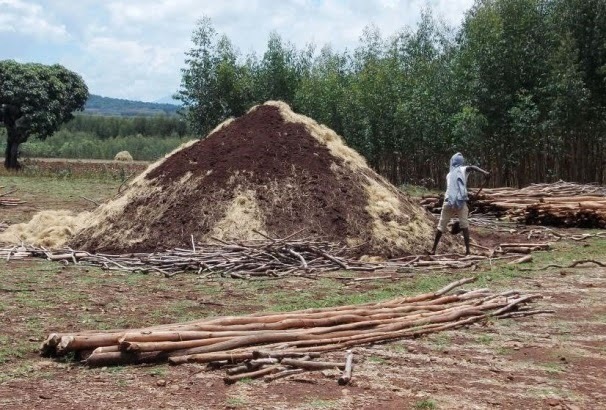 This new method of charcoal production may provide an alternative fuel source that reduces the need to burn dry cattle manure or cut down wood from indigenous forests. Perhaps this new development may inform debates on the growth of Eucalyptus woodlots.